I quite like the Japanese clear umbrellas (for me there's something romantic about being able to see through your umbrella while it rains). The only problem is, in my past experience they tend to break easily. Granted, I bought mine at a convenient store next to a train station, so it was cheap and probably the quality wasn't great to begin with. I donno if that would be true for these plastic umbrellas as well. See now THIS is what I've been waiting for. I REALLY like clear umbrellas. My last Hello Kitty one was stolen from me! That's the last time I use an umbrella bin, especially if I nab one of these. I purchased the Chibi Usa and Usagi one. 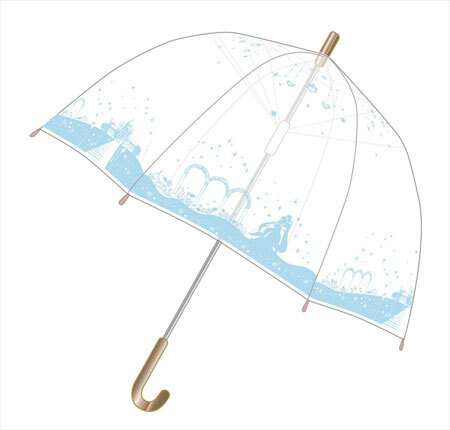 ♥ The price was not too extreme, and I really like umbrellas. I really like the Sensitivity version. These are really cute! I thought at first I would be all about the senshi one, but then I saw the Serenity and Endymion one and now I can't decide which I like better. When I first clicked on this, I was like 'Oh God, what weird and silly merchandise are they releasing now?' But they're actually quite beautiful! Which is a strange thing to say about an umbrella xD If I actually used an umbrella, I'd definitely buy one! Already ordered the serenity and endymion one-I've always been a sucker for pastel blues. Unlike many other Sailor Moon items that have been announced for sale or pre-sale recently (especially Crystal items), these look like worthwhile products to buy because they have a strong link to the title, and are not ridiculously over-priced. Once I can save up the money to buy one, I'm going to get myself one of the senshi umbrellas. I've kind of been wanting recently to start using an umbrella, instead of just having to rely on my thick jacket with a hood, and getting one of these would be a good excuse for me to start doing so . I've been meaning to buy an umbrella as well, and the price on these really isn't bad at all. The trouble is, I'm moving in a little over a month and I'm very sure I'll be in a different city by the time these actually ship. Maybe I could have it sent to my mom's and see if she'll forward it to me. I got mine two days ago. The quality is worse then any umbrella I could buy at the dollar store. It's incredibly low quality, and I honestly regret buying this. It's like the slightest gust of wind will make it inside-out. ...maybe you got a bootleg by accident???? D: that sounds awful!!! Nah, this was from CD japan. They're legit. I'm sorry that you aren't enjoying yours, Cosmos-Hime. I received mine the other day, and I really like it. I'm a big fan of the spring-loaded opening mechanism; some of my favourite parasols have that feature. 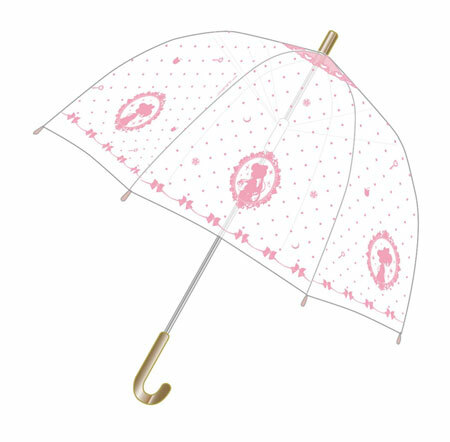 The design is really cute, and the umbrella is not so small that it won't keep me dry. I haven't carried it in the rain, but with the weather we've been having I'm sure I'll get the opportunity soon. I'm glad I decided to cancel my order then! I really love clear umbrellas and my hello kitty one was stolen (that's the last time I leave a cute umbrella in an umbrella stand...) but if this is low quality then I won't be getting it. As a brief update, I've carried mine on three separate days of torrential rain with no adverse effects. Hm, I suppose it's possible Cosmos just got a defective one or something. Does anyone have pics of theirs? I feel like that would help me decide which one I want. Aren't there pics of each of the 3 in the first post of this thread, @Henshinyo ? Those are concept images, I wanted to see the actual product. You will soon, especially if you live SoCal. This next is supposed to have torrential rain storms. I should have bought one but I was like I'm gonna wait cause it barely rains here and then the news of the rainstorms and my first thought now is "DANG! I should have bought one.